In its early years, the Yreka Railroad drew 67% of its revenue from passenger receipts, reaching a peak ridership in 1912 of 30,801. The advent of the automobile and attendant road system steadily eroded traffic forcing the railroad to switch to a home built Gas Electric to cut costs. By 1929 the rider count had dropped to 2,980 and passenger service would end in the 1930's. From that point on, save for an occasional excursion with borrowed SP equipment, the railroad was freight only. 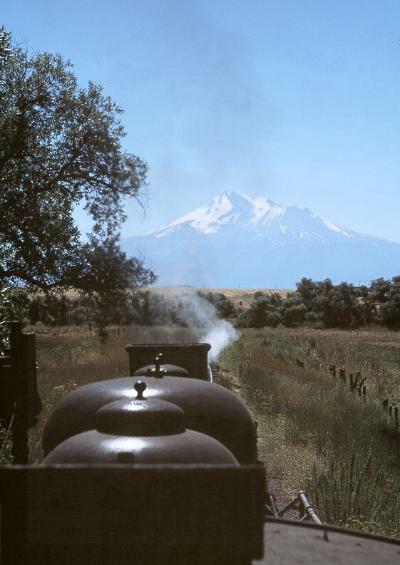 In 1986 however, the railroad decided to tap the tourist market by offering round trips between Yreka and Montague. That service would increase in popularity with the return of the #19 in 1989 when fellow Kyle property OP&E left the passenger excursion business. Left: The debut of Yreka Western's new excursion service at the depot on June 14, 1986. 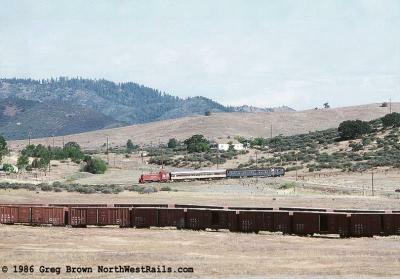 Center: The first train descends Butcher Hill after leaving Yreka. Note stored WCTR boxcars. Right: A photo run-by for the "Goose Nest Mountain" weekend trip on August 16, 1986. All Photos by Greg Brown. 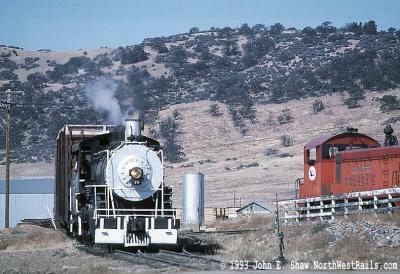 Left: After an eighteen-year absence, the #19 returned to the Yreka Western. Shown near the summit of Butcher Hill on August 20, 1989. 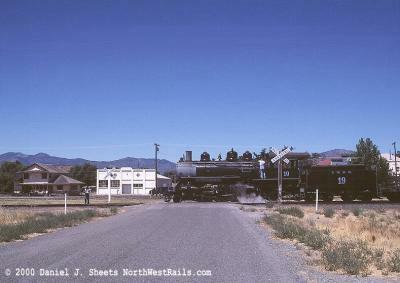 Right: Number 19 and the "Blue Goose," at Milepost 6 on August 20, 1989. Note the distinctive Kyle Industries Goose trademark inspired milepost. Both Photos by Greg Brown. 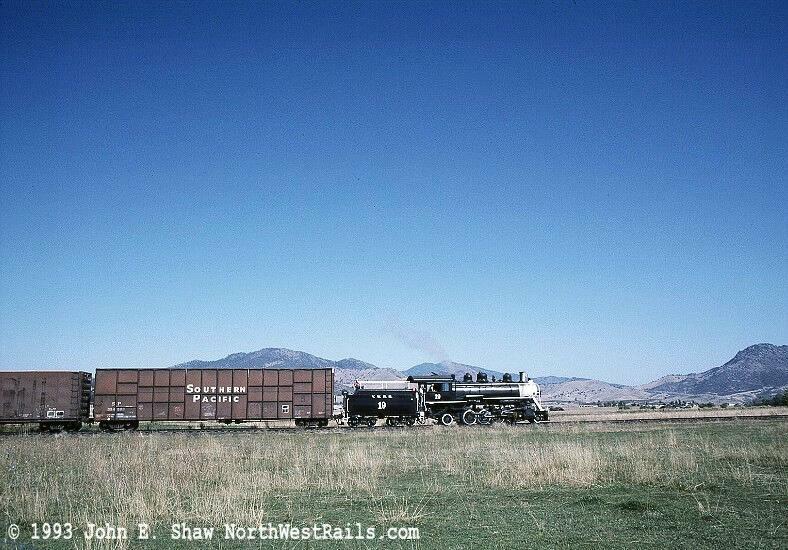 Yreka Western #19 works in the small yard at Montague, California on October 2, 1956. Photo by Jack Bowden. In 1915 Baldwin Locomotive Works #42000, a 2-8-2 weighing 178,400 lbs, left the shop floor at Eddystone, Pennsylvania bound for its new owner, the Caddo & Choctaw Railroad of Arkansas. Upon arrival it was given a number, #4, and a name, (rare at that late date) of R. L. Rowan. 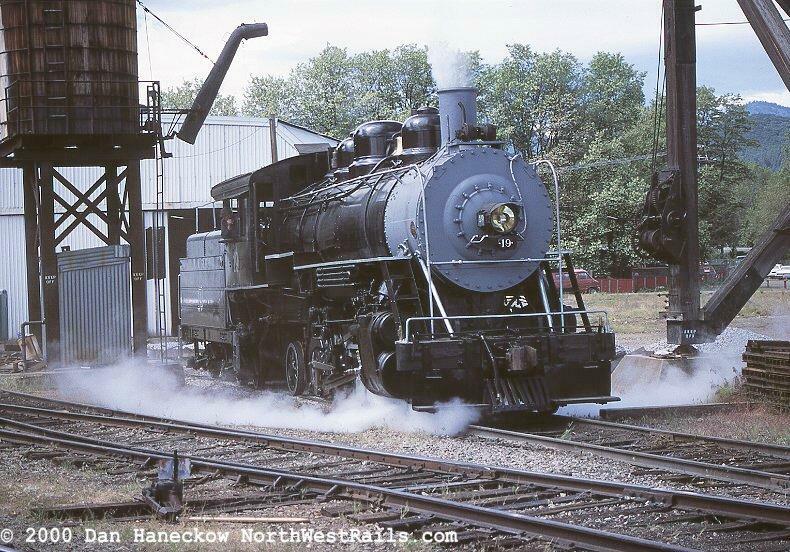 Some time within the next nine years it was sold to the nearby Choctaw River Lumber Company where it kept the number #4. The engine was sold again in 1920 to the United Mining and Smelting operation in Mexico where it was numbered #2069. During its short time in Mexico, the locomotive witnessed the chaos of revolution, returning from that country with dents and bullet holes to show for its adventures. Later in 1924 it was sold again, this time to California's McCloud River Railroad on the southern slopes of Mt. Shasta. 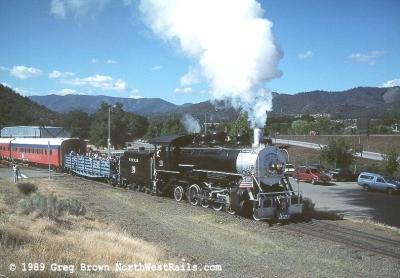 In 1994 the #19 returned to its former home rails for an excursion on the McCloud Railroad. 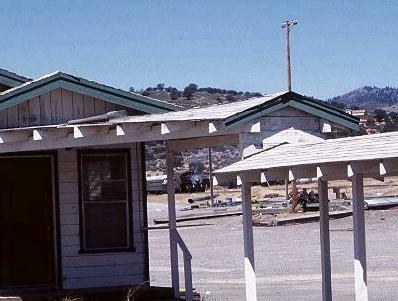 It is shown here at Bartle, California. Photo by Matthew Robbins. 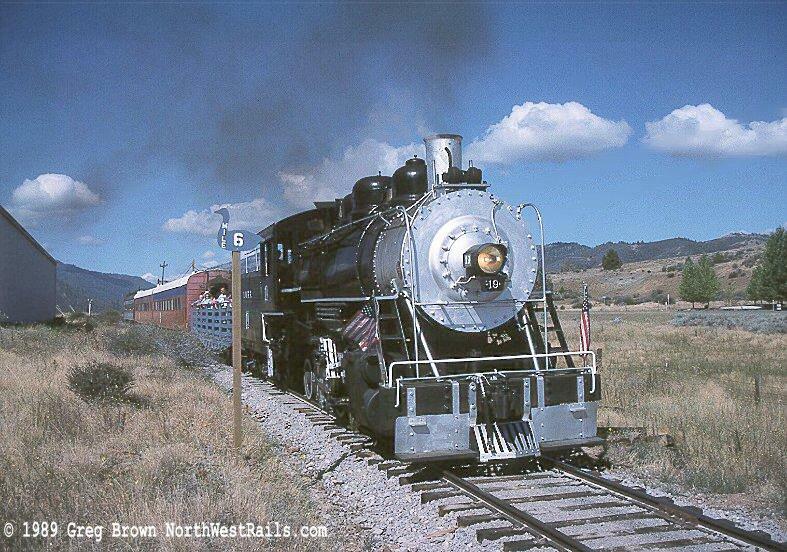 McCloud River Railroad paid $25,000 for the locomotive. 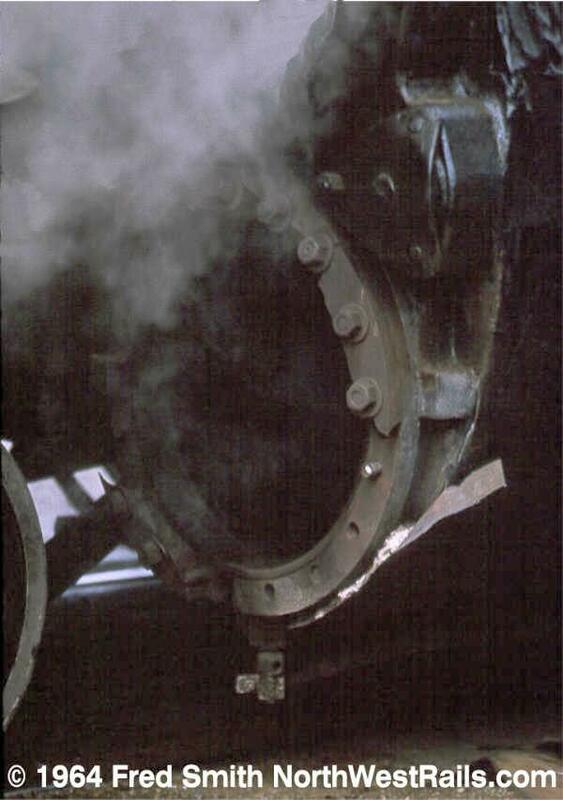 The railroad's shops repaired any damage from its Mexican exploits and gave it a new number, #19, and a nickname, "Pancho." 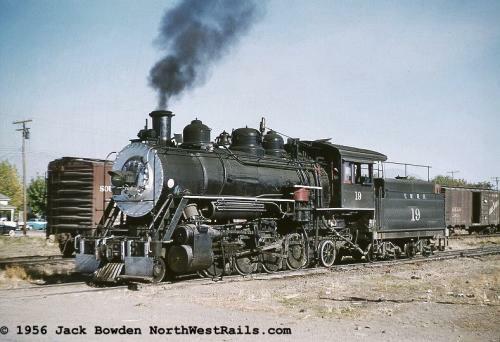 McCloud River Railroad had an informal tradition of rostering twin pairs of locomotives and oddly enough, the #19 was nearly identical to the railroad's #18 (Baldwin #41709) built a year earlier (1914) and purchased new. In contrast to the #19's adventures south of the border, the #18 had gained fame as a show piece at the Panama-Pacific International Exposition held in San Francisco in 1915. 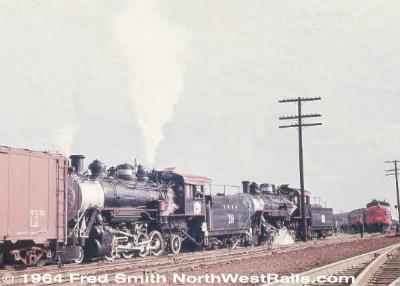 The nearly identical sisters served on the McCloud River Railroad in a roster of similar sized 2-8-2 and 2-6-2 locomotives until bumped from service by new Baldwin diesels. 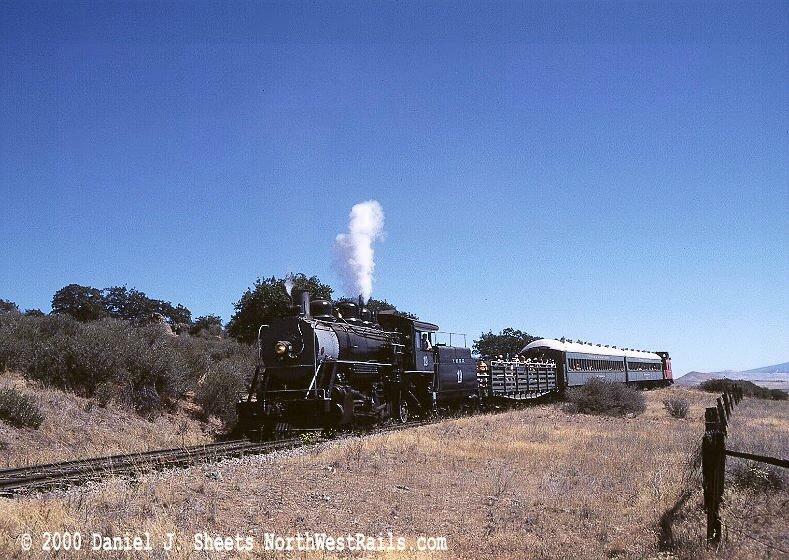 In 1953, surplus after twenty-nine years of service, the #19 was sold to the Yreka Western. Until the #19's arrival, the Yreka Western was making due with a pair of worn out 0-6-0 switchers, the #7 and the #8, both which had been acquired from the State Belt Railroad in 1944. 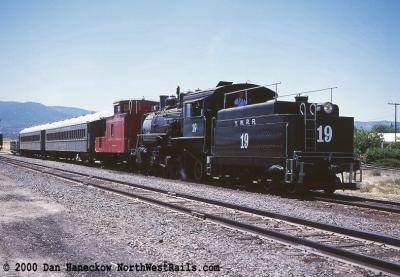 The #19 allowed the retirement of the #7, which was scrapped on site at Yreka. In 1955, impressed with larger motive power, the railroad purchased another 2-8-2, this time from the nearby Long Bell Lumber Company operation out of Tennant, California. 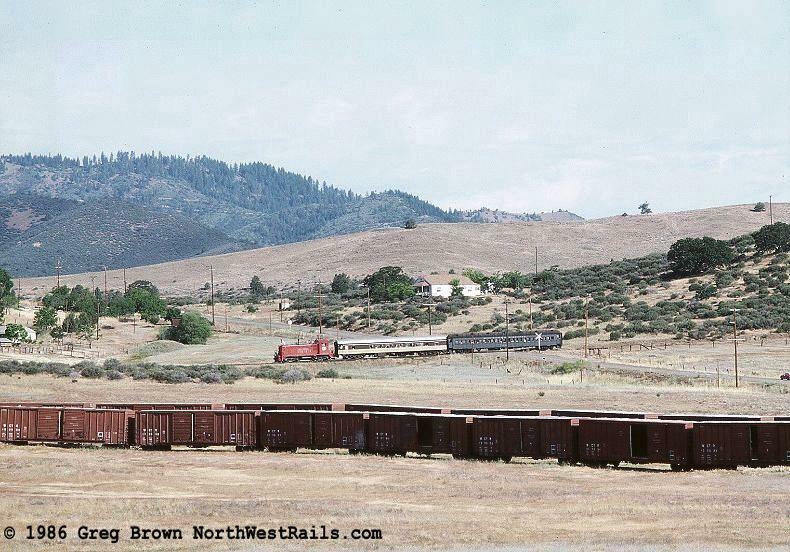 The #100 proved to be too heavy for the rails and was scrapped in Yreka that very year. The next locomotive purchased by the railroad would have no such problem, being the closest thing to a known commodity possible. In 1956, the #18, the "twin" of the #19 was purchased from the McCloud River Railroad. 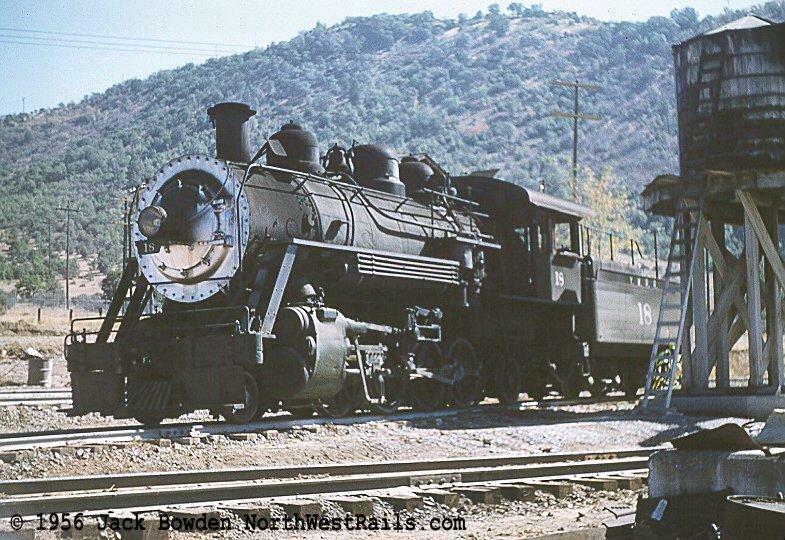 Left: The #18, newly arrived from the McCloud River Railroad in Yreka on October 1, 1956. 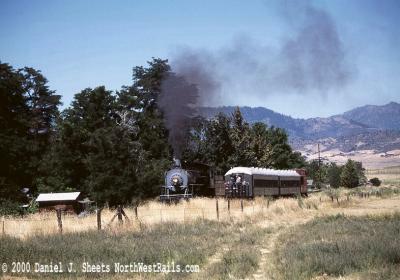 Right: The #19, just west of the Shasta River crossing having just slowed down to avoid wandering cattle, an occurrence that still happens at that location to this day (see Part One). Date: October 2, 1956. Both Photos by Jack Bowden. 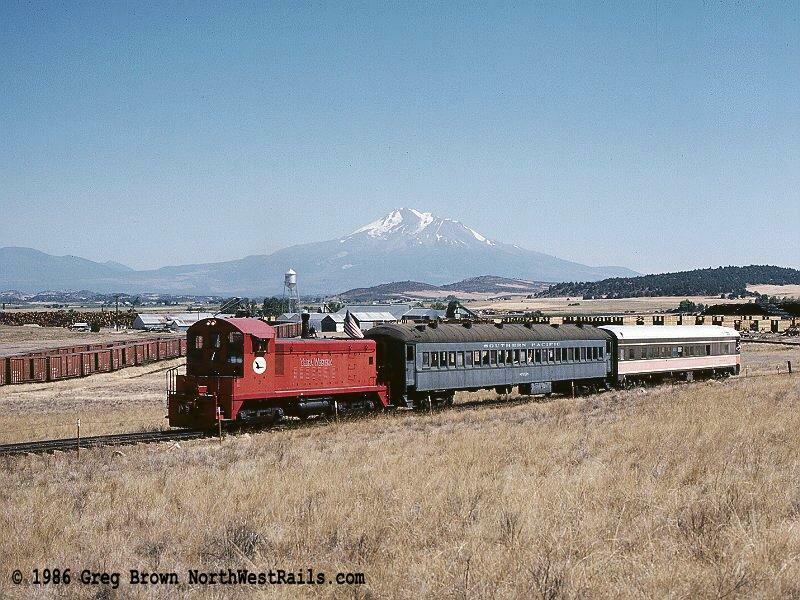 Yreka Western rails in the shadow of Mt. Shasta. 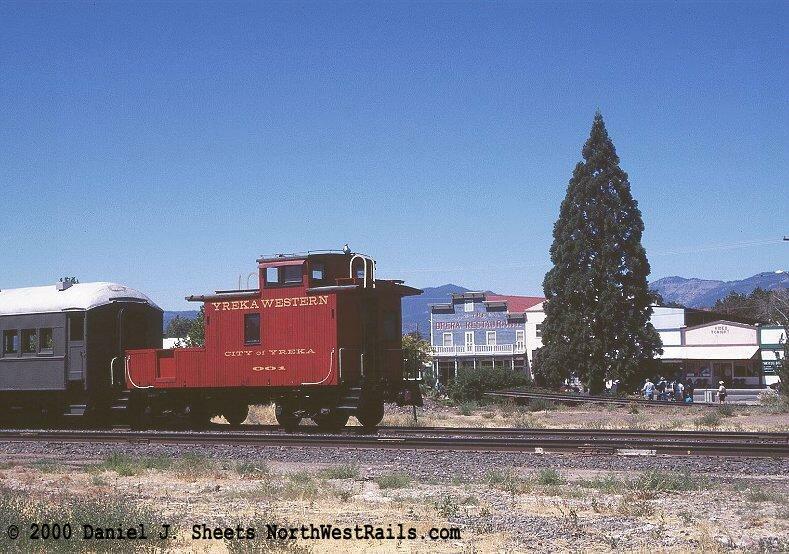 The #18 and #19 were not the first two locomotives the Yreka Western had purchased from McCloud. 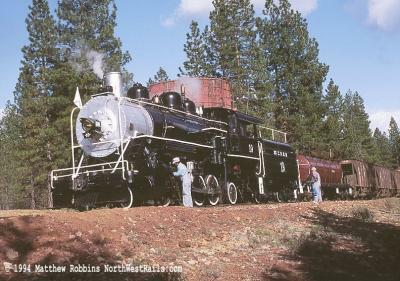 In 1930, the railroad purchased McCloud River Railroad #10, a 2-6-2, followed in 1936 by McCloud River Railroad #9, (another "twin" pair). 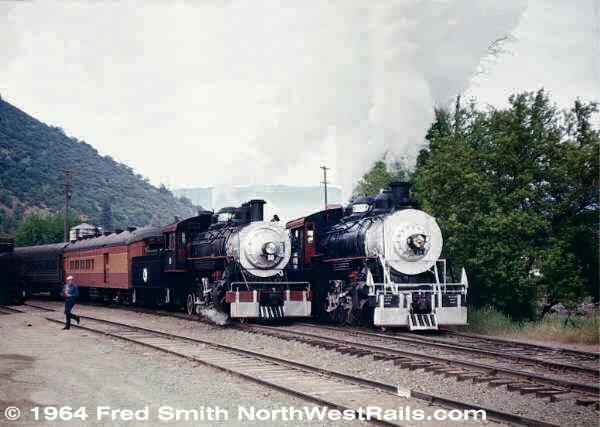 The Yreka Western would sell both locomotives in 1944. (Incredibly, of the four locomotives owned by both the Yreka Western and McCloud River Railroad, three still exist and all three are still in operation; the #9 on Wisconsin's Kettle Moraine Railroad, the #18 newly restored on the McCloud Railroad and the #19 on the Yreka Western). The first diesel, SW8 #602, arrived on the line in 1958. 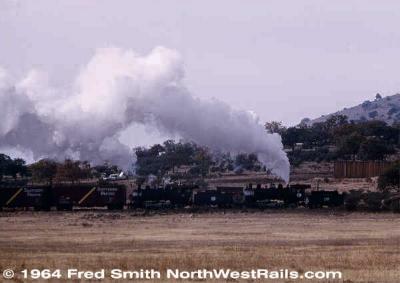 From that point on the steam locomotives would be used in a back up role or to power occasional excursions. 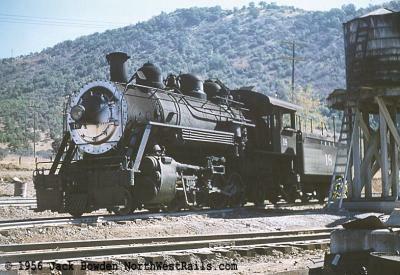 It was on an excursion in 1964 where the #18 suffered damage that would end its operating career on the Yreka Western. 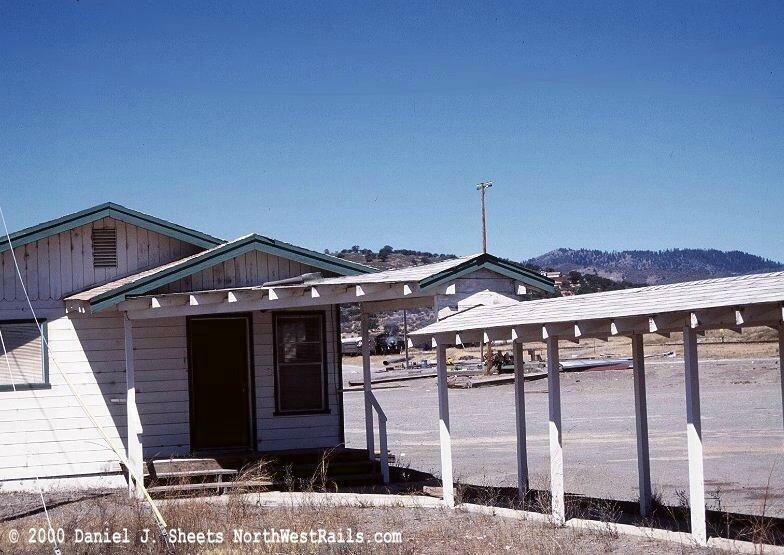 From that point on it would remain in storage at Yreka until 1999 when it was sold back to the McCloud Railroad. It was restored to operation in 2001. The #19 remained in its back up role but with the arrival of two Alco S1 units in 1963, its services were seldom needed. 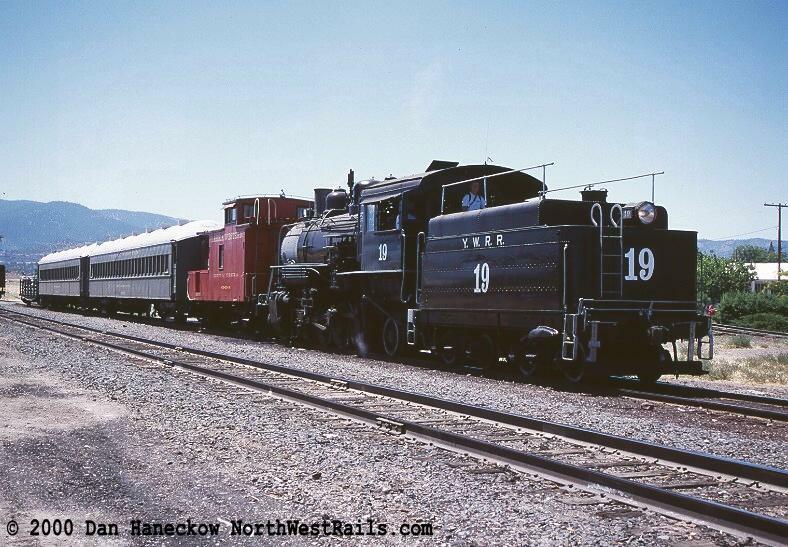 Then in 1971 after eighteen years on the Yreka Western, the #19 began a whole new career. 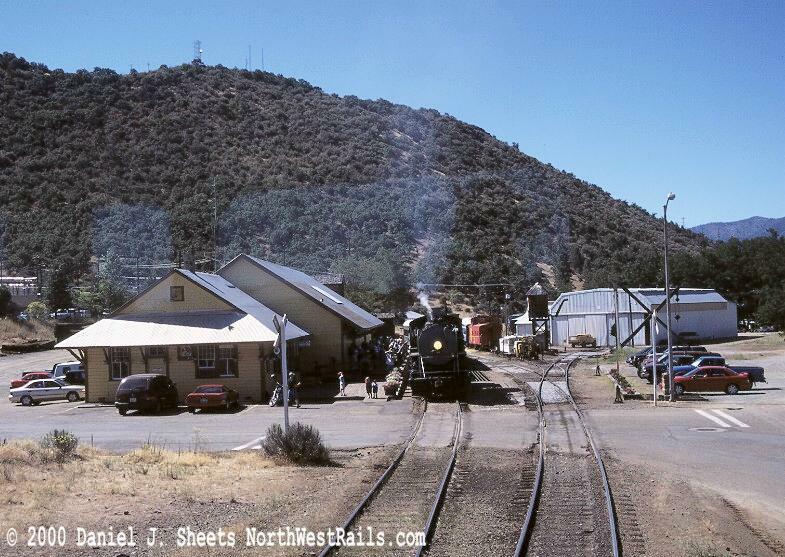 Left: The passenger excursion has arrived in Montague, disembarked its passenger, and is now completing a few switching moves before returning to Yreka. 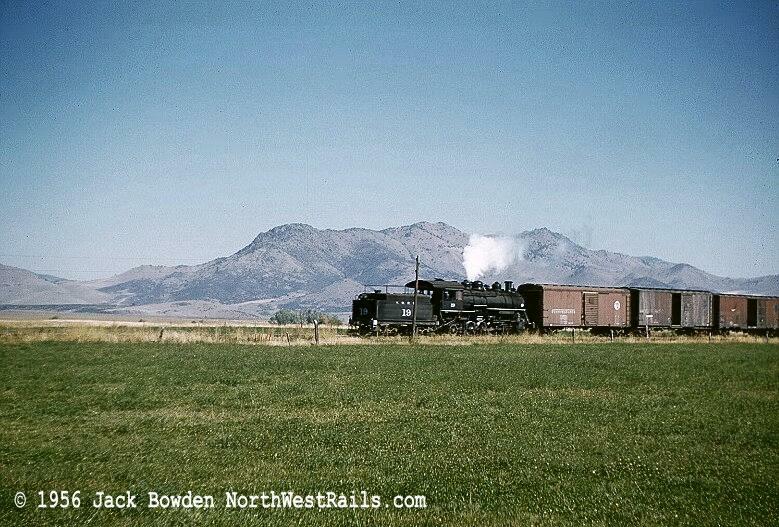 Note the Southern Pacific scarlet and gray F9 sitting to the right of the excursion train in 1964. Center: A photo run-by in 1964. 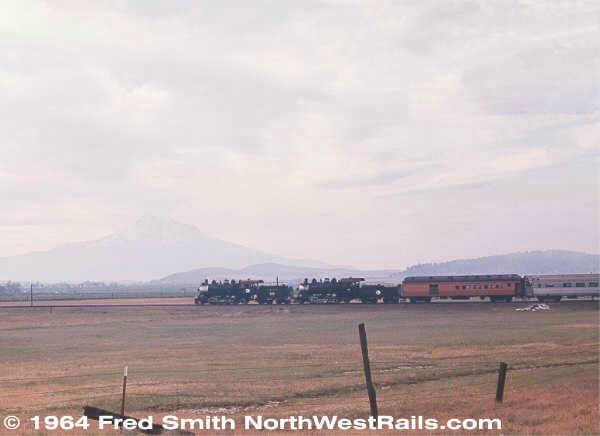 In this picture note the railfan and his car parked behind the passenger excursion. Right: On this same 1964 trip, Yreka Western #18 blew a cylinder head and was sidelined permanently until 1999. 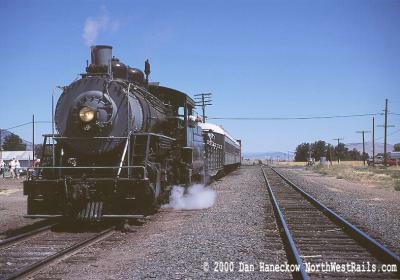 In 1999, the #18 was sold to McCloud Railroad and restored to operation in 2001. Two hundred fifty-one Siskiyou Line miles north of Montague was the Oregon Pacific & Eastern Railroad. In 1970, Kyle Industries purchased the short line, which ran seventeen miles from Cottage Grove, Oregon east into the Bohemia District of the Cascade foothills known as the Calapooya Mountains. 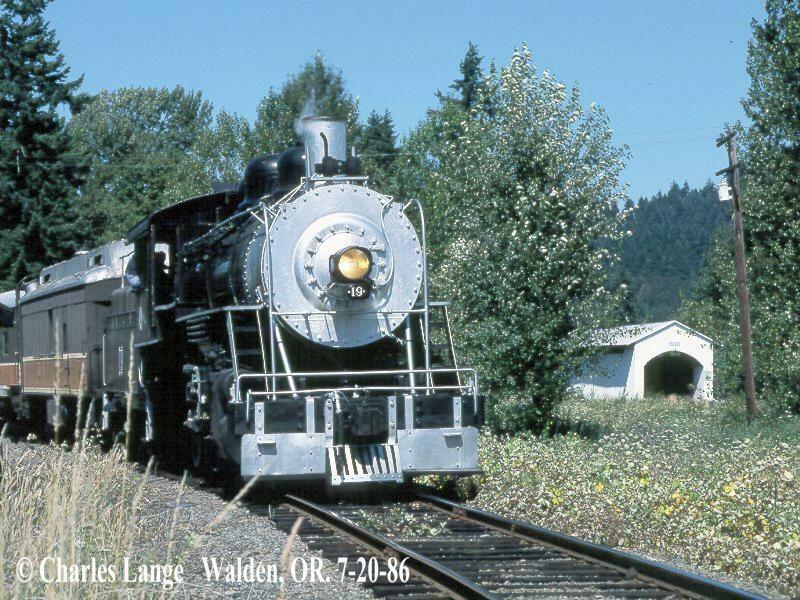 From the beginning Willis Kyle recognized the potential of an excursion train into the forests and along the shores of Dorena Lake. That train, to be called "the Goose" would be steam powered. 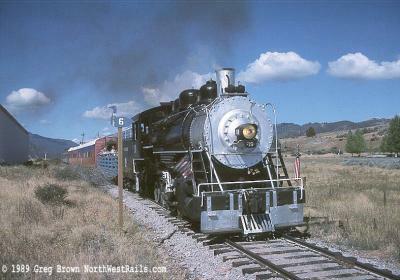 In 1971, the #19 was transferred north to the OP&E to headline the new attraction. 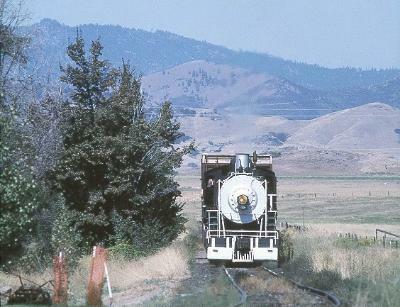 Left: The #19 and the "Goose" passes Dorena Lake on August 11, 1984. 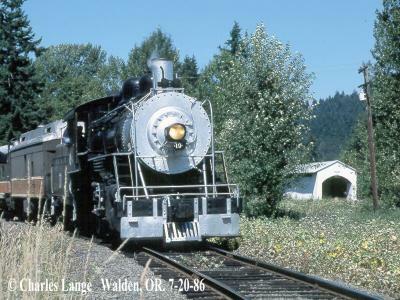 Right: Number 19 near the covered bridge at Walden, Oregon on July 20, 1986. Both Photos by Charles Lange. The #19 would take the "Goose" into the Calapooya Mountains for eighteen years, until co-owner Bohemia Incorporated decided to leave the passenger (and eventually railroad) business. Within that time span, the #19 would also star in two motion pictures. Movie making on the Oregon Pacific & Eastern dated back to 1926 when "The General" starring Buster Keaton was filmed on the line. In 1972 the railroad was chosen as the setting for "Emperor of the North," a story of a maniacal conductor with a hatred for hoboes. At that time the OP&E owned a second steam locomotive, the #5, a 2-8-0 which had been purchased from the Magma Arizona Railroad. For the filming of the movie, the #5 was numbered #4 on one side, #27 on the other, and #5 on the front. 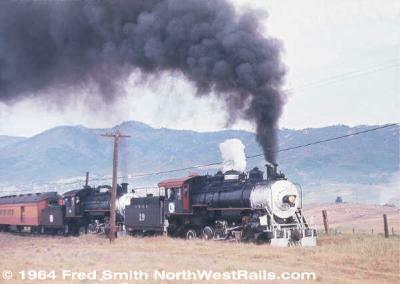 Added with the #19, two locomotives had became four. 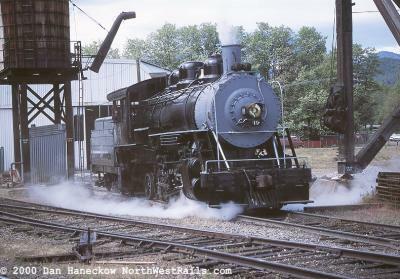 Late in its Oregon Pacific & Eastern career, the #19 appeared in the 1986 film "Stand By Me" most of which was filmed in the Willamette Valley town of Brownsville, Oregon. 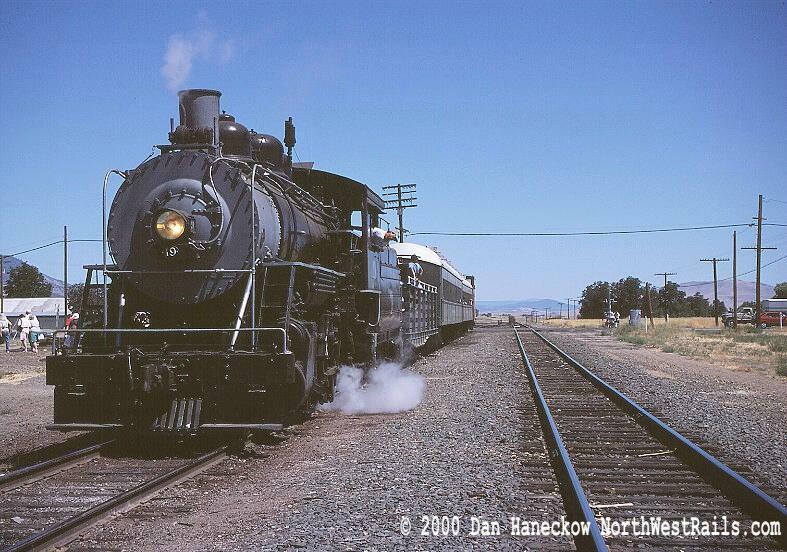 The railroad scenes though were shot on the OP&E and the McCloud River Railroad. 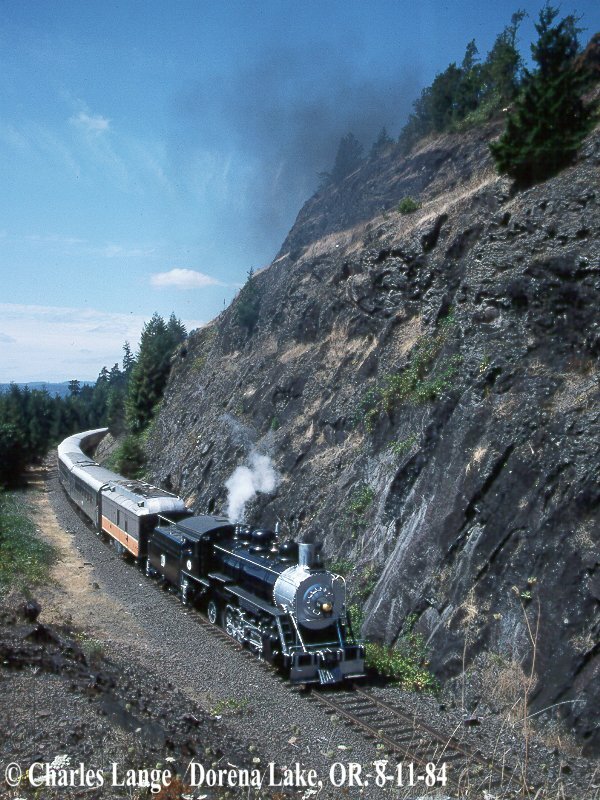 The famed "running from the train on a trestle sequence" was shot with the McCloud River Railroad's #25, a former roster mate of the #19. 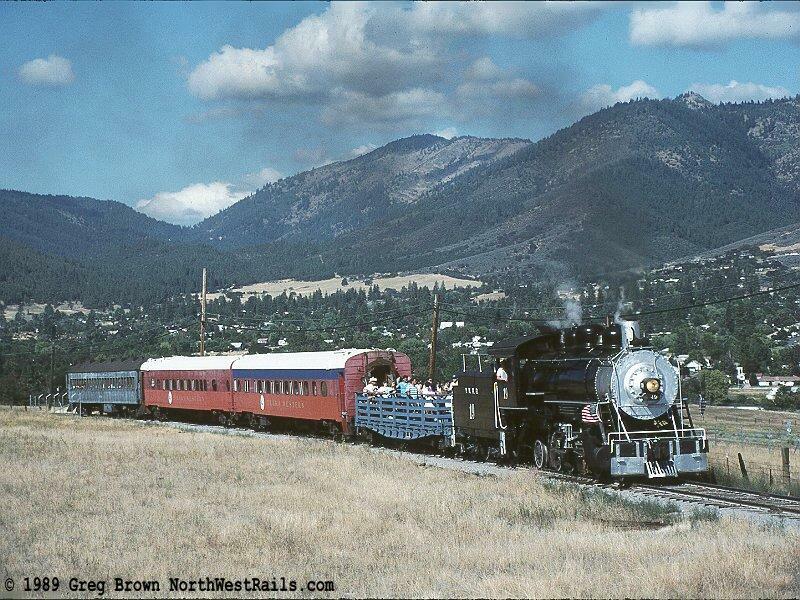 Sharp-eyed viewers will note that scenes filmed on the Oregon Pacific & Eastern have gray ballast, while those on McCloud River feature red ballast. 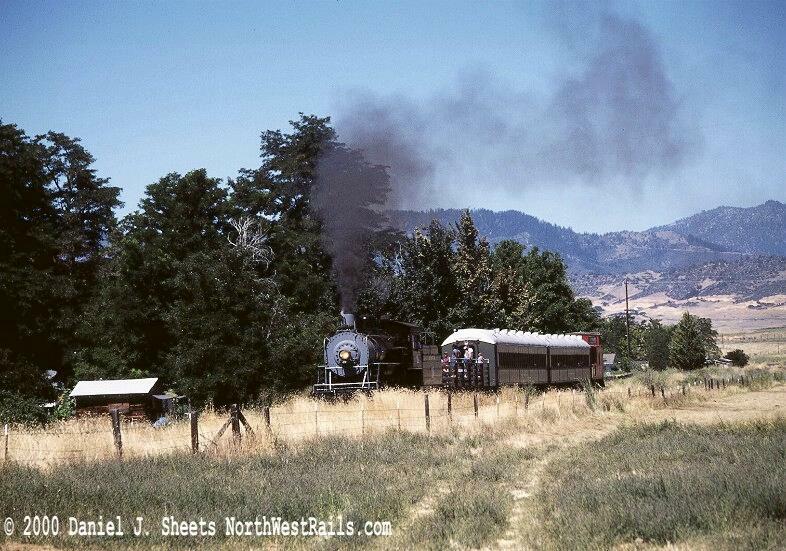 The #19 back on the Yreka Western on August 20, 1989. Photo by Greg Brown. The #19 returned home to Yreka in 1989 and was put to work on the Yreka Western's version of the "Goose" train, replacing an SW8 diesel locomotive very similar to the one that relegated the #19 to back up service in 1958. Once again the #19 worked below the slopes of Mt. Shasta, where, when combined with the time spent on the nearby McCloud River Railroad, the #19 had worked for nearly fifty years. After a brief hiatus during the 1999 abandonment proceedings the locomotive was able to return to service for the 2000 season. The #19 and freight arrive at Montague on September 7, 1993. Photo by John E. Shaw. 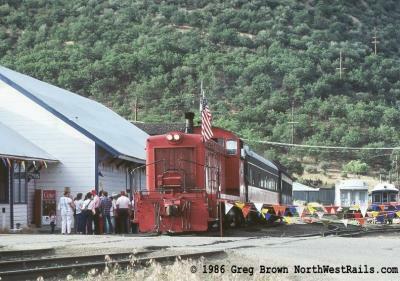 Left: The return of the "Blue Goose," first day of service May 27, 2000 in front of the Yreka enginehouse. 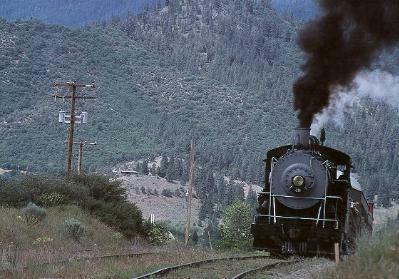 Right: The #19 ascends Butcher Hill on May 27, 2000. Both Photos by Dan Haneckow. When the #21 arrives from Montague at 11:00 AM a crowd is already waiting beside the steamed up #19 in front of the depot. The #21 pulls forward and is spotted near the enginehouse. Dennis Woodruff and Larry Tuttle leave the diesel and climb aboard the steam locomotive to confer with Bill Killion, Engineer on the #19 for the trip to Montague and back. 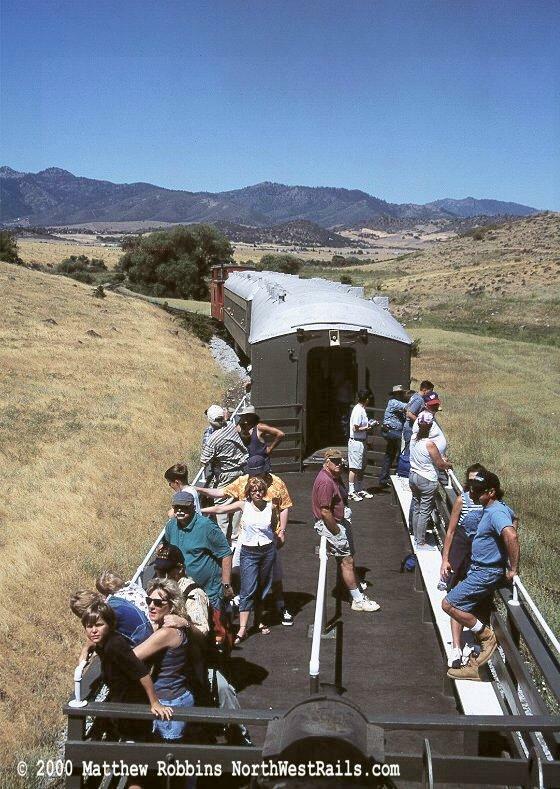 The passengers are loaded on to the train, while on the locomotive, last minute adjustments are being made. For this trip Larry Tuttle will be Fireman while Dennis Woodruff joins the train crew. At 11:30 AM with a shriek of the whistle, the #19 and the Blue Goose departs for Montague. 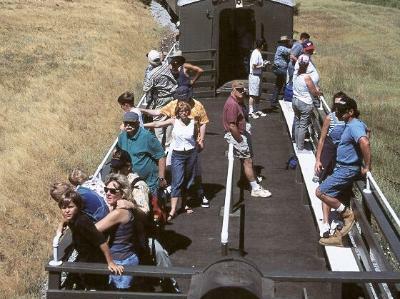 Left: At the depot, 11:15 AM, on August 29, 2000. Photo by Daniel J. Sheets. 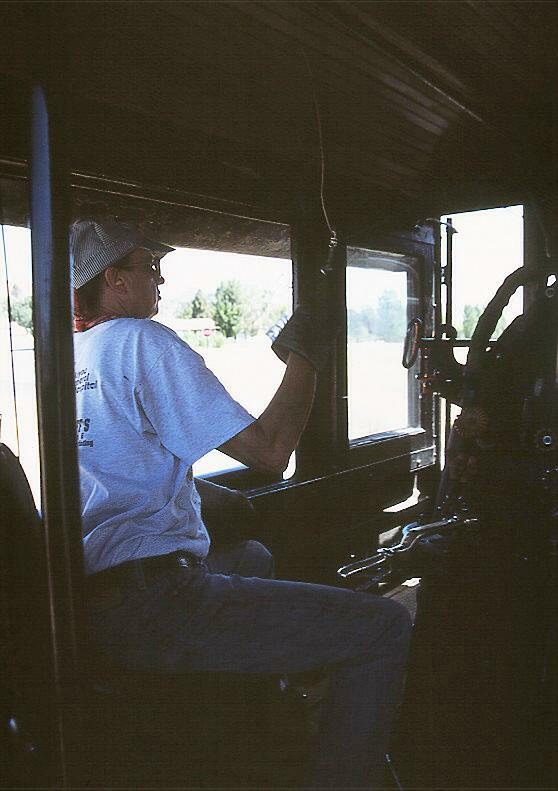 Right: Fireman Larry Tuttle in the cab of the #19. Photo by Matthew Robbins. Left: Descending the east side of Butcher Hill . Photo by Daniel J. Sheets. Right: The "Blue Goose" open air car from the tender of the #19. Photo by Matthew Robbins. Left: Upon arrival at Montague, the passengers unload and explore the town, visiting the small stores and the park. For a half-hour the town is fairly busy. 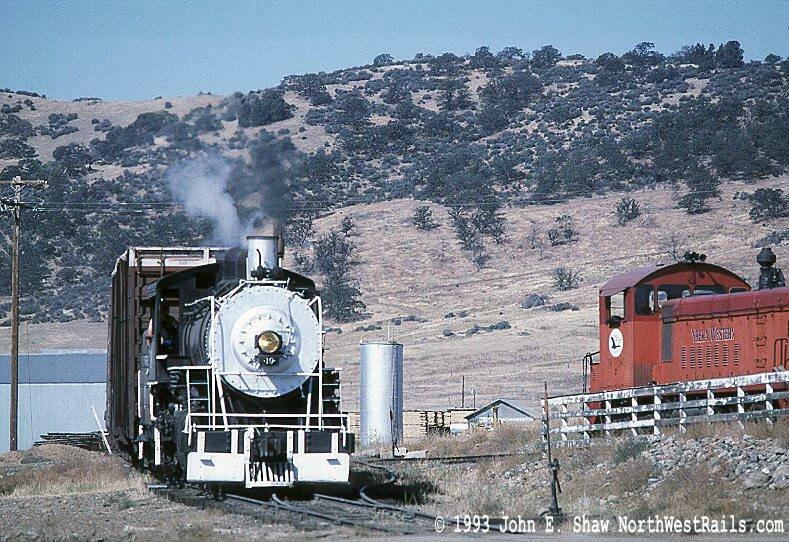 Right: Caboose "City of Yreka" and the Montague skyline. Both Photos by Daniel J. Sheets. 2:15 PM. The Blue Goose arrives back at Yreka. The passengers are unloaded, the cars are spotted and the #19 returns to the enginehouse rejoining the #21. 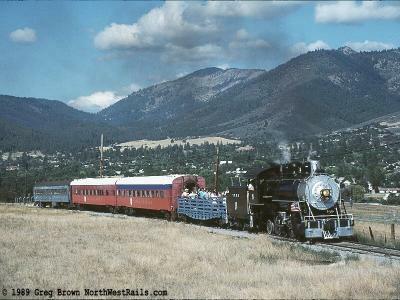 The day has finished on the Yreka Western. Another day in a series that stretches all the way back to 1888. May the series stretch just as far forward! November, 2012 Update: The Yreka Western continued to operate through the end of 2008. 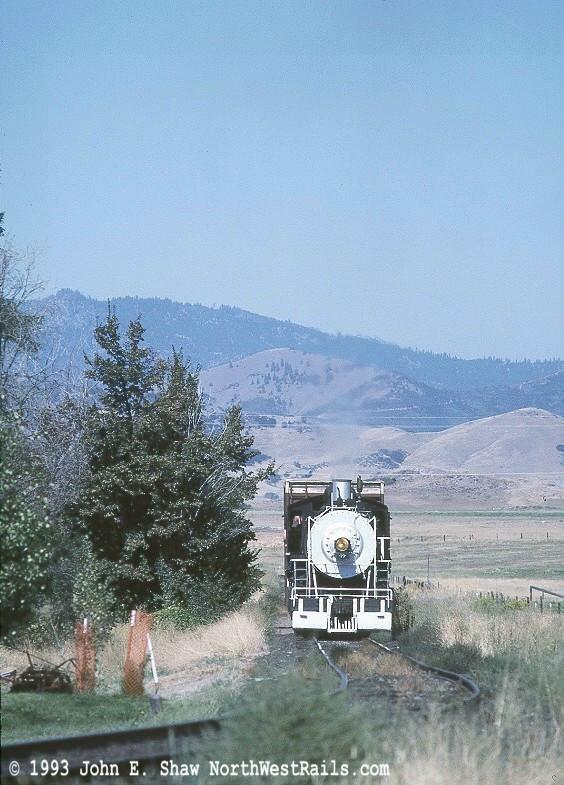 Citing the the loss of freight revenue due to the closing of the Central Oregon & Pacific between Montague, CA and Ashland, OR, the Yreka Western was unable to continue to operate the Blue Goose excursion train. Locomotive No. 19 remains in Yreka awaiting repairs, much of the other equipment has been scrapped or removed from the property and the sidings and most of the yard tracks west of the Timber Products run-around have been torn up with the rail sold. Meanwhile CORP's parent company, Rail America, has tentatively been sold to Genesee & Wyoming, the operator of the Portland & Western. Grant money has been obtained to rebuild the Siskiyou LIne over the "Hill" north to Ashland. 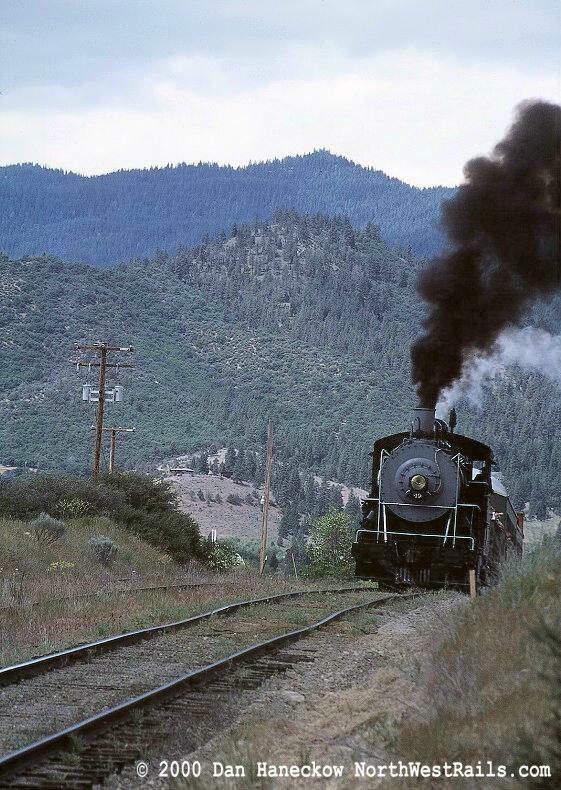 Time will tell whether this is too little, too late to save the Yreka Western or if the "Little Railroad that Refuses to Die" can survive to pull freight and passengers once again. All photos and text © 2000, 2001, 2012 by the original photographers and writers.